Patricia is one of Singapore’s most recognisable and celebrated comediennes, and true to form, she’s a blast on set, making everyone laugh intermittently at her crazy antics and uninhibited speech. Yet we also get to see the side of Patricia that most people don’t — the hardworking professional who is also genuinely sweet and sincere to everyone she meets. “Except stupid people,” she says. “I’m only allergic to stupid people.” A believer in working hard and playing hard, Patricia says that’s the only way to find a good balance in life and to really enjoy what you do. “When I’m working I really concentrate, and I cut out all the social things — I stop going partying with friends, I stop going out for dinner, and just concentrate on my job. So everyday is just like, I go to work, come back, go to work, come back. But once I’m finished on a project then it’s really party time.” When asked what inspires her to keep going, she simply says, “Passion. I will work for people who are sincere, and because I like being on stage.” Her favourite part of her job is getting to meet different people, and being able to be different people. “I’m able to do a lot of things that other people cannot do. Sometimes, in different roles, we have to act out other occupations, so that’s why I say that some artistes can easily switch jobs because we learn how to do so many things!” Patricia is proudly Singaporean, and says that Singlish is one of her favourite things about our country, along with how clean the city is and that she can be effectively bilingual. Other Singaporean traits: her must-haves in her bag include a big packet of tissue. “You cannot live without tissue!” She also has markers to sign autographs when she needs to, and also carries a little mirror with a photo of the singer G-Dragon from Korean band Big Bang, of whom she is a big fan, with her. Patricia picked her bold shoes today to specially match the colours of her Anna Sui tote bag, and describes her style as crazy, fierce, and bitchy diva. “Can say anot!” she checks with her publicist. “Can I call myself Bitchy Diva Mok?” Everyone laughs, because we know the opposite to be true. 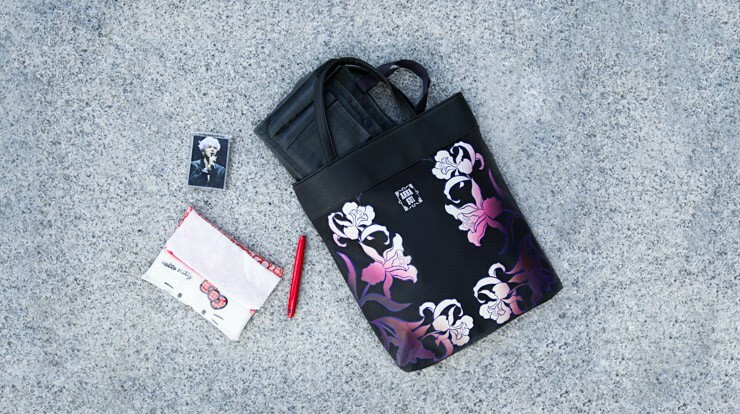 The limited edition Anna Sui tote bag featured is not for sale. Find out how you can get one at here. This is a Shentonista project for UOB Cards, in collaboration with Anna Sui.